(Dec. 1, 2014) — Environmental Science and Technology, a journal of the American Chemical Society, recently published research by University of Kentucky chemistry Assistant Professor Marcelo Guzman, graduate student Elizabeth Pillar and senior Robert Camm. Environmental Science and Technology publishes papers that are particularly significant and original in the fields of environmental science, technology and policy. The article, "Catechol Oxidation by Ozone and Hydroxyl Radicals at the Air-Water Interface," features the team's findings from work funded by the National Science Foundation (NSF) Division of Chemistry and NASA Kentucky Space Grant Consortium and EPSCoR Programs. 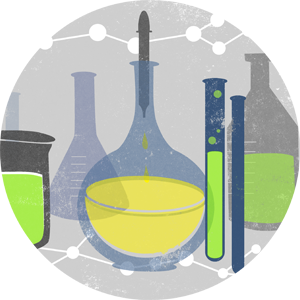 Their research opens new doors to understanding how the complexity of interfacial chemistry translates into reactions that cause significant changes in the atmosphere. Aerosols particles suspended in the lower atmosphere have a direct effect on climate by absorbing or reflecting sunlight, depending on their chemical composition, and indirectly by seeding clouds. Aerosols are commonly created from the condensation of gaseous pollutants emitted into the atmosphere from human made processes, such as car engines' internal combustion, or naturally occurring phenomena like forest fires. Scientists have found it difficult to study the fate of these combustion pollutants under humid conditions, as well as identifying reactions that produce molecules capable of generating aerosols in atmospheric waters, according to Guzman. However, the research by Guzman, Pillar and Camm reveals the complex reactions that pollutants can undergo on the surface of liquid particles under atmospheric conditions. Looking at the degradation pathways of aromatic materials on the surface of microdroplets, the team found that when the particles react with gaseous ozone and hydroxyl radicals, as they would in the atmosphere, reactive low molecular weight carboxylic acids, polyphenols and quinone molecules are quickly produced. The new products contribute precursors to cycle the formation of aerosols, and can change the absorption properties of atmospheric particles by imprinting a brownish color to them. Brown carbon aerosols normally contain low volatile organic compounds of similar complexity to humic substances. "By characterizing the short-lived contaminants that are present in brown haze, this work will guide the development of new technologies targeted to solve pollution problems — with direct benefits for public health and climate," said Guzman. 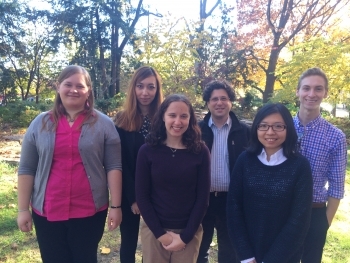 Photo Left to right: Alexis Eugene, Evie Zhou, Elizabeth Pillar, Marcelo I. Guzman, Shasha Xia and Robert Camm. Photo courtesy of Marcelo Guzman.